This is our first guest post from Blake at You Design It.Â Hopefully, this will become a regular guest spot as he gives us a t-shirt printer’s perspective to help you design t-shirts. 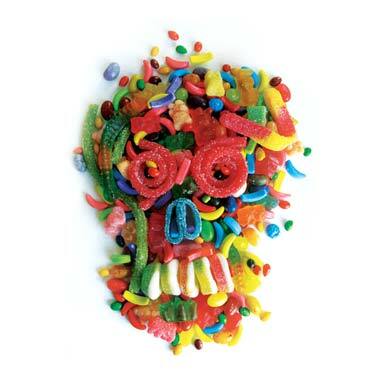 Besides this candy giving you a toothache, 4-color process printing on apparel can often give the printer a headache. It is a science in itself and can produce lackluster results when not created properly. You can refer to another post I recently did at MyInkBlog about 4-color process printing to get into the meat and potatoes on the subject. I just wanted to show this print because it seems like a new door opening at Threadless on both the creativity side of submitted designs and the capability side of their printing. This may not be their first full color print but it looks like they went all out and are not shying away from it! Color Overload Has Officially Launched!